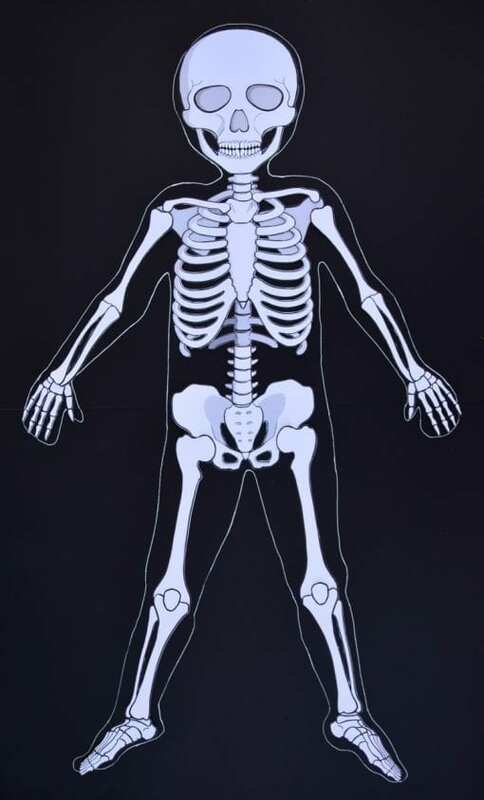 Is it too early for your kids to learn anatomy? Not at all! Our printable anatomy bundle introduces the subject in a playful, creative and engaging manner! 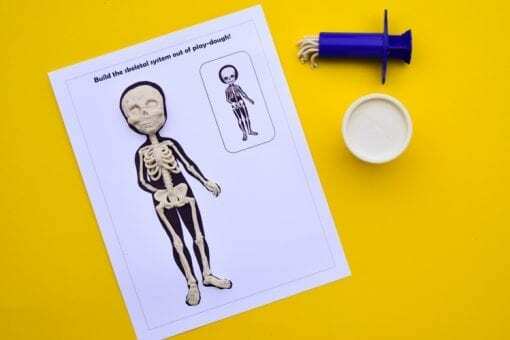 Whether the children are building a life-size paper skeleton or making a play-dough digestive system, they’re going to enjoy doing the activities while learning all about their bodies. 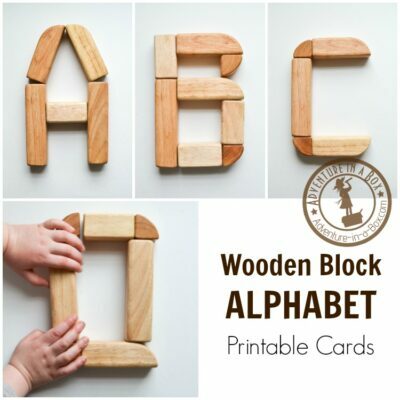 111 pages. 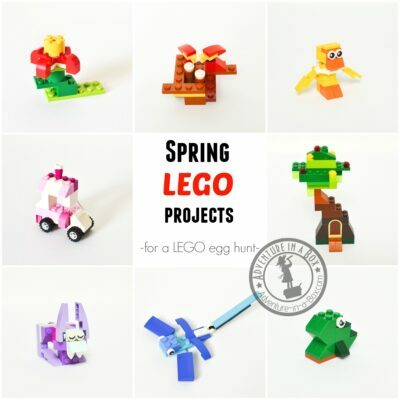 40 Mb of colourful fun. 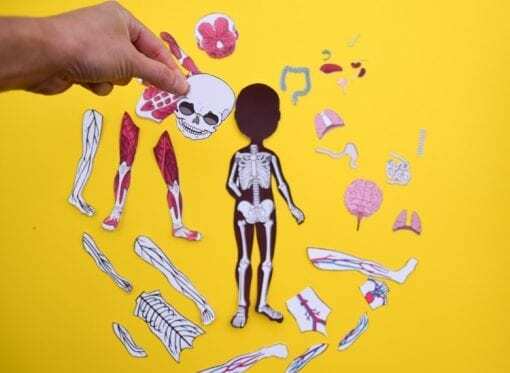 What is a good age for learning about human anatomy? 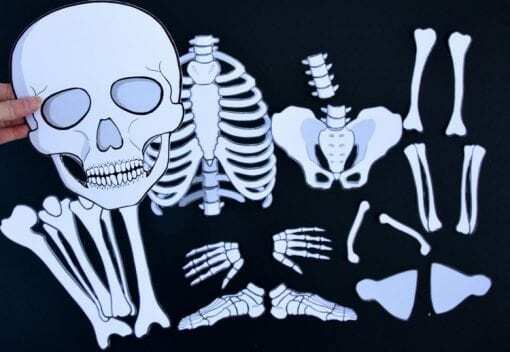 Most children get their first anatomy lessons before they turn one. 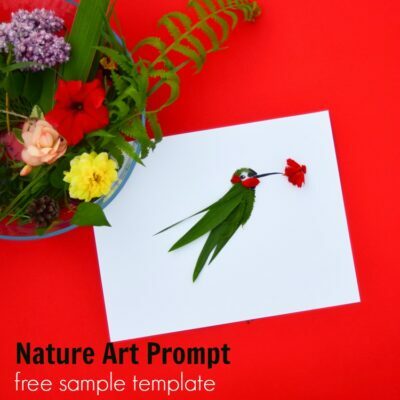 “This is your mouth. This is your nose. 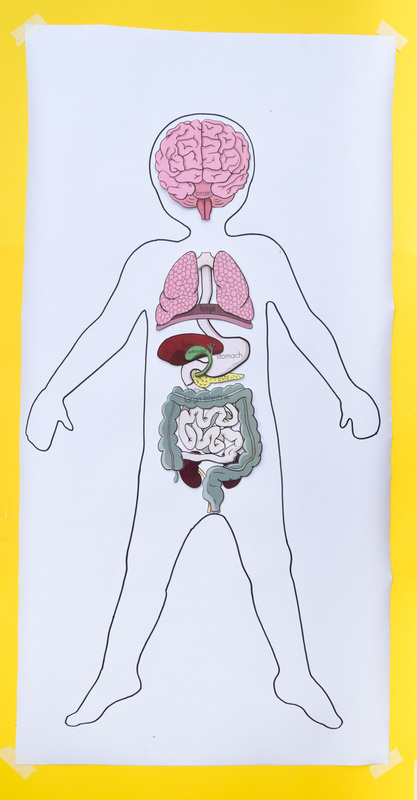 This is your belly button.” Very easy to teach because children understand that it is all about them. 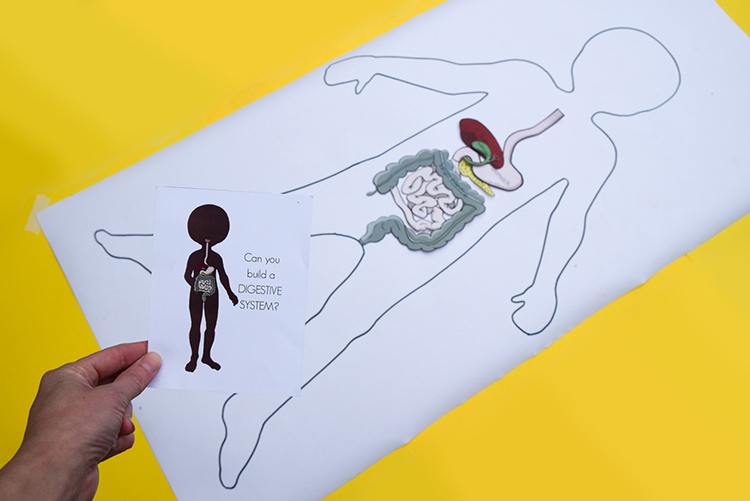 Now, with this anatomy printable bundle, they can visualize their bodies on the inside. 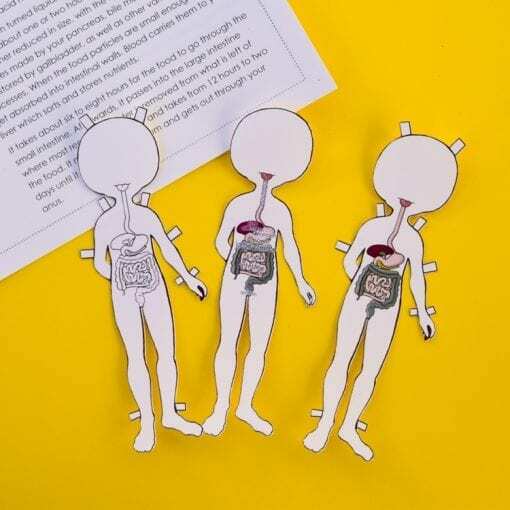 Following this hands-on anatomy unit study, children get to build life-size anatomy models of themselves, play with anatomy dress-up dolls, complete anatomy puzzles, build organs from play-dough, colour, draw and play games! 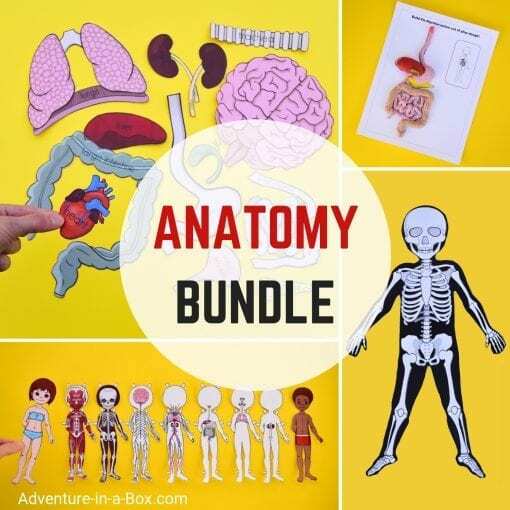 The anatomy bundle is full of creative activities for young scientists. 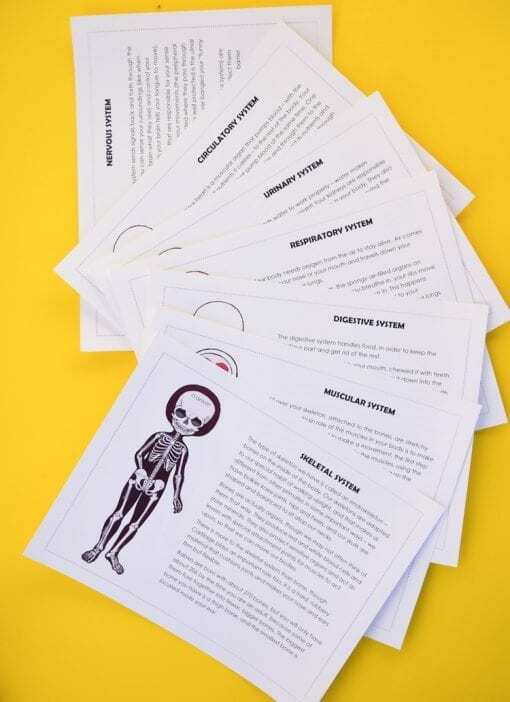 Colourful information cards: The cards include descriptions of eight body systems – respiratory system, digestive system, circulatory system, urinary system, nervous system, muscular system, skeletal system, and integumentary system. 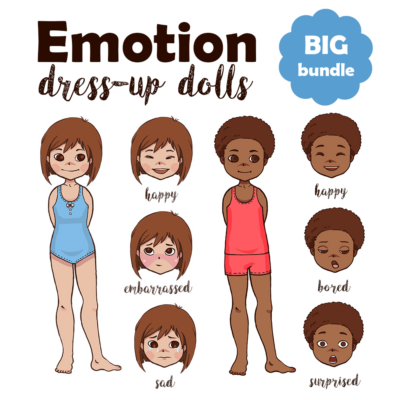 Anatomy dress-up & magnetic dolls: The printable anatomy dolls make for playful companions to studying anatomy with kids. 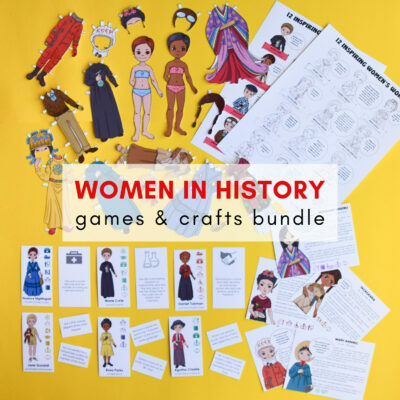 There are four dolls – two boys and two girls – and if children want to make them even more personalized, they can colour the black-and-white versions which are also available. In the anatomy set, the dolls come with layers that represent different human body systems. 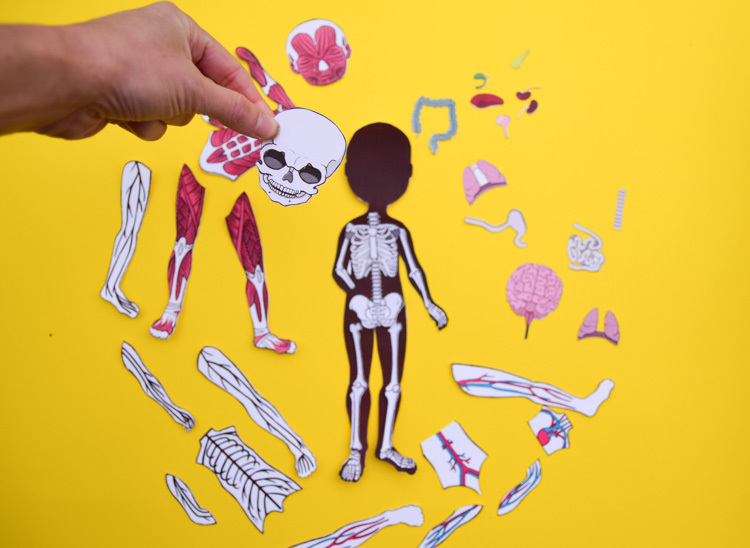 Placing a system layer on the body layer helps children visualize the interconnected layers of the skeleton, muscles, and other internal organs. 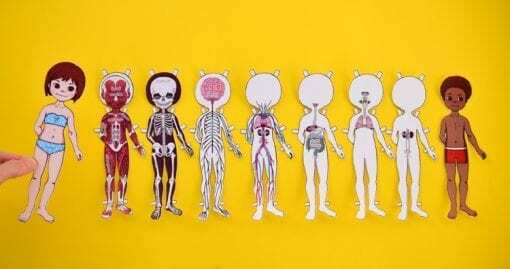 Anatomy body puzzles: While the paper dolls show the body systems in their entirety, the anatomy puzzles focus on the organs that make up various body systems. 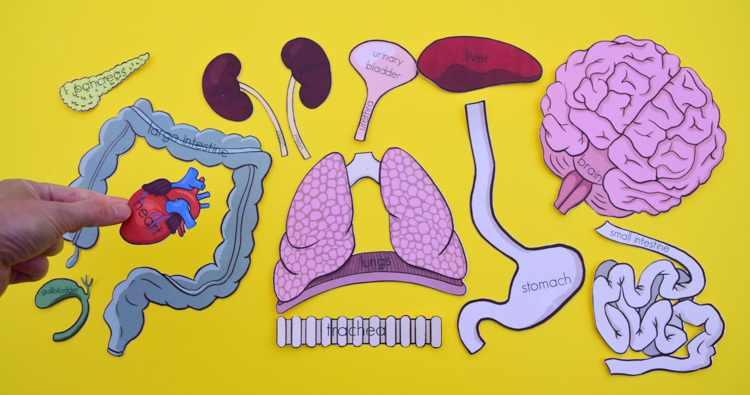 With anatomy puzzles, the students can practice sorting different organs into the body systems they belong to and build body systems from scratch. 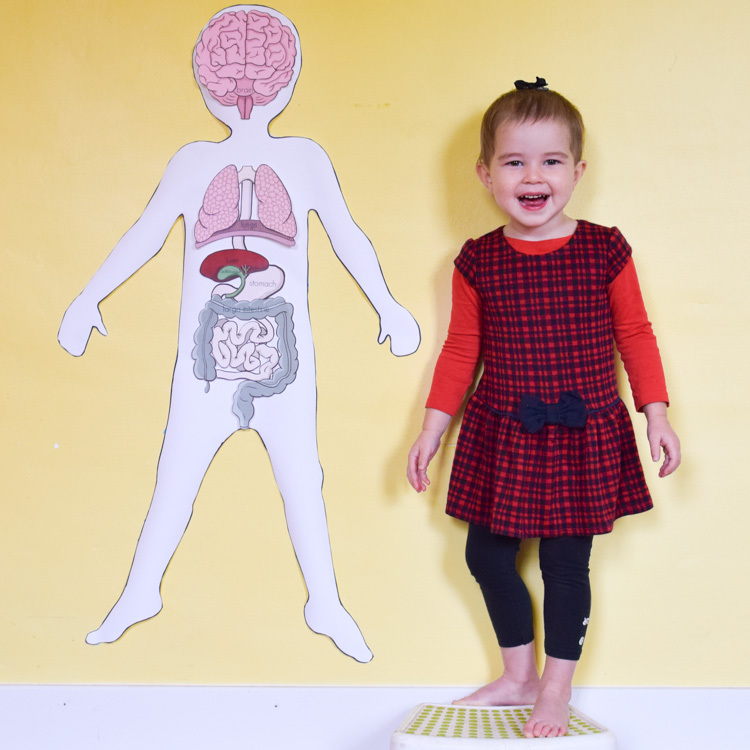 Life-size printable organs: Build anatomy paper models the size of a child! You can make the skeleton, digestive system, respiratory systems, nervous system, urinary system – or just put as many organs as you can together. This activity helps children connect the anatomical concepts to themselves. Anatomy colouring pages: The anatomy colouring pages let children combine science with art. 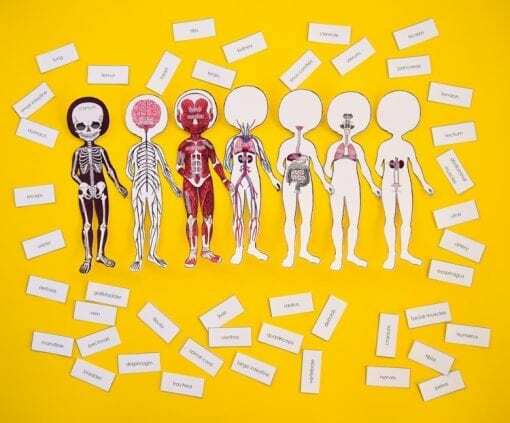 They learn anatomy while having fun and giving a personal touch to the anatomy worksheets. 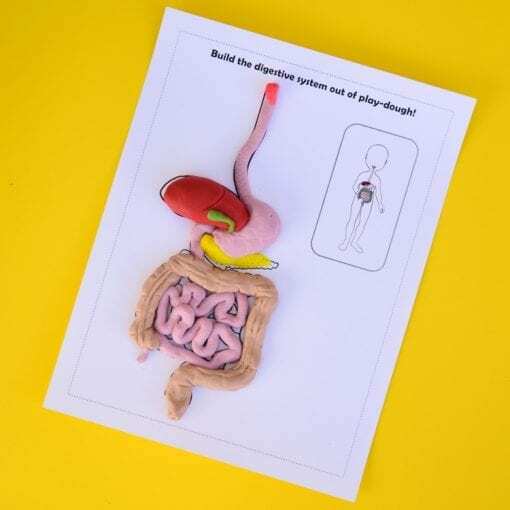 Anatomy play-dough mats: Similarly to the colouring pages, the play-dough mats inspire the combination of science and art while children build 3D versions of the anatomical systems. 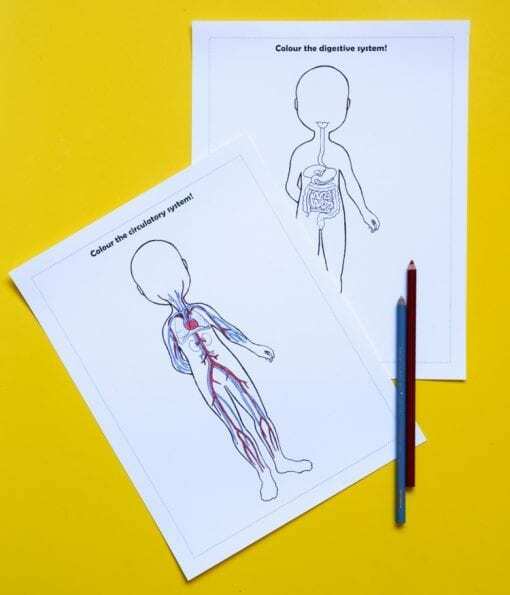 Anatomy drawing pages: Simple, but challenging – these pages encourage children to draw their own anatomy models! Anatomy I-Spy game: The game works with most of the activities in this bundle. 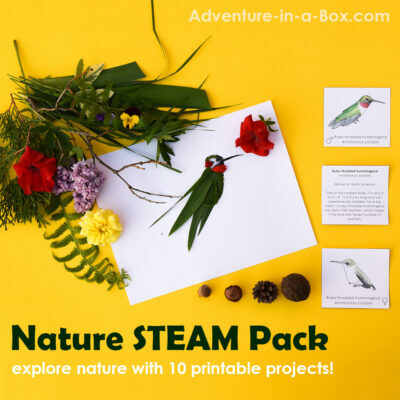 You can use it with paper dolls, colouring pages or life-size models.